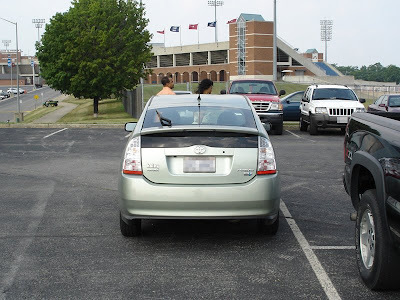 More bad parking jobs; the next few pictures of poorly parked cars were taken at my cousins high school graduation. A few of which get a rating that's off the charts due to the fact that they were not even in a parking space. This Toyota Prius is one of them. It's parked close to the civic center and is obstruction traffic flow.